Kochiyama was one of the most prominent Asian American activists of the 20th century. Mary Yuri Nakahara was born on May 19, 1921, in San Pedro, California, one of three children of immigrants Seiichi Nakahara, a fishmerchant entrepreneur with social connections to the Japanese elite, and Tsuyako “Tsuma” (Sawaguchi) Nakahara, a college-educated homemaker and occasional piano teacher. Kochiyama’s community service began in her youth as a Sunday school teacher and leader of numerous girls’ groups. In the late 1930s, when few Nisei participated in mainstream organizations, Kochiyama became the first female student body officer (vice president) at San Pedro High School and played on the school’s tennis team. She was also a sports writer for the San Pedro News-Pilot. Some contend that her social consciousness began in childhood, where she befriended new students, rooted for the underdog sports team, and had her mother drop her off blocks from school, embarrassed by her family’s relative affluence and fancy car. But Kochiyama denies having any political awareness, stating that she got car sick. Given her domestic aspirations it is curious that she gained little housekeeping and childcare training, preoccupied instead with extracurricular activities. Her twin brother Peter, who did the most chores, was tolerant of his sister’s limited housework, but her older brother Art was not. 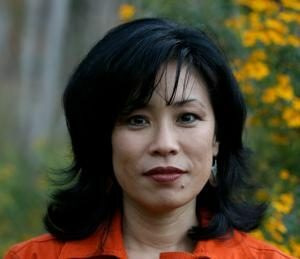 Peter attributed his siblings’ conflict to “Mary [being] so different and Art [being] just such a typical Nisei.” While lacking any feminist consciousness, her behaviors foreshadowed her rebelliousness and ability to circumvent making housework her individual responsibility. On December 7, 1941, Kochiyama had barely returned home from teaching Sunday school when three FBI agents arrived. Kochiyama’s father, home recovering from ulcer surgery, was whisked away and, unbeknownst to the family for days, detained at the Terminal Island federal penitentiary. Rumors abounded that her father was an enemy spy and Kochiyama was expelled from several organizations. The family believed Nakahara’s arrest arose from his supplying Japanese ships docking in San Pedro harbor and hosting Japanese ship officials at his home. Three other issues were prominent to the FBI. First, FBI records show that Nakahara’s name was found among the papers of Itaru Tachibana, a Japanese naval officer arrested in June 1941 on espionage charges, as a result of Nakahara’s 1937 donation to the Nippon Kaigun Kyokai or Japanese Navy Association. Second, the FBI intercepted a cable declining a visit with Nakahara from his childhood friend Kichisaburo Nomura, the Japanese Ambassador negotiating peace with the US throughout 1941. Third, Nakahara served as head of the San Pedro Japanese Association and the Central Japanese Association of Southern California in the early 1920s. None of these activities rendered Nakahara subversive. It is now known that Nakahara was one of 1,300 Japanese American community leaders detained within the first 48 hours of Pearl Harbor. Nakahara’s six-week detention aggravated his health problems and he died on January 21, 1942, the day after his release. Kochiyama’s correspondence became public news, as she printed excerpts from soldiers’ letters in her Jerome camp newspaper column, “Nisei in Khaki.” She also supported Nisei solders at the Jerome USO, where she met her future husband, the charming and strikingly handsome Pvt. Bill Kochiyama. As the Civil Rights Movement grew, Yuri began inviting activists to speak at their open houses. In 1960, a move to Harlem inadvertently expanded their activism. With Yuri as the family’s leading force, the Kochiyamas worked with the Harlem Parent’s Committee, organizing school boycotts to demand quality education for inner-city children. Yuri was among the 600 arrested for blocking the entrance of a construction site to demand jobs for Black and Puerto Rican workers. In October 1963, at a Brooklyn courthouse, she met Malcolm X and boldly inquired if he might support integration. Instead of his transformation, she found herself unexpectedly drawn to his audacious proclamations for Black liberation. In June 1964, at Yuri’s invitation, Malcolm arrived at the Kochiyamas’s to meet Japanese Hibakusha (atomic bomb survivors) and journalists on a world peace tour. She began attending the weekly Liberation School sessions of his Organization of Afro-American Unity. Kochiyama and her oldest son were in the audience at Harlem’s Audubon Ballroom in 1965, when Malcolm X was assassinated. A photograph in Life magazine shows Kochiyama offering comfort to the slain leader, yet there is no mention of her by name or any acknowledgement of an Asian American presence at Malcolm’s talk. 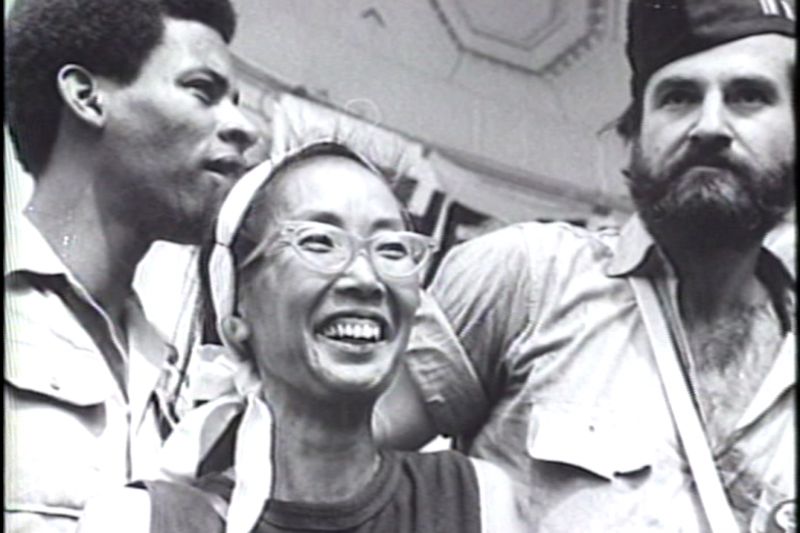 Diane C. Fujino, Heartbeat of Struggle: The Revolutionary Life of Yuri Kochiyama(Minneapolis, MN: University of Minnesota Press, 2005), 19. FBI file of Seiichi Nakahara, Aug 27, 1941; Dec 6, 1941; Dec 23, 1941; Jan 23, 1942; June 22, 1943; Kenji Murase, “An ‘Enemy Alien’s’ Mysterious Fate,” National Japanese American Historical Society (winter 1997), 4-5, 14. Kochiyama diary, vol. 2, September 9, 1942. Diane C. Fujino, “Grassroots Leadership and Afro-Asian Solidarities: Yuri Kochiyama’s Humanizing Radicalism,” in Want to Start a Revolution? : Radical Women in the Black Freedom Struggle, eds. Dayo F. Gore, Jeanne Theoharis, and Komozi Woodard (New York: New York University Press, 2009), 294-316. ———. 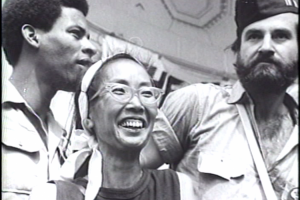 “Grassroots Leadership and Afro-Asian Solidarities: Yuri Kochiyama’s Humanizing Radicalism.” In Want to Start a Revolution? : Radical Women in the Black Freedom Struggle, edited by Dayo F. Gore, Jeanne Theoharis, and Komozi Woodard, 294-316. New York: New York University Press, 2009. ———. “The Black Liberation Movement and Japanese American Activism: The Radical Activism of Richard Aoki and Yuri Kochiyama.” In Afro Asia: Revolutionary Political and Cultural Connections between African Americans and Asian Americans, edited by Fred Ho and Bill V. Mullen, 165-187. Durham, NC: Duke University Press, 2008. Originally published by Densho Encyclopedia under the terms of a Creative Commons Attribution-NonCommercial-ShareAlike 3.0 Unported license. This entry was posted in Civil Rights, History, Human Rights. Bookmark the permalink.